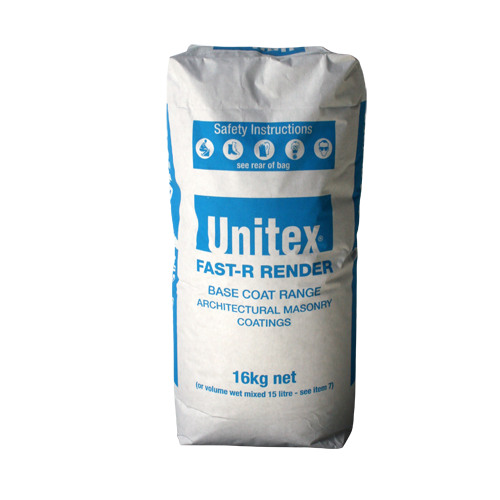 In dry, mild conditions, Uni-Dry Cote® Fast–R Render should be dry after 72 hours after application. 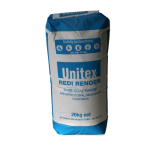 When dry, Uni-Dry Cote® Fast-R Render can be overcoated with a texture from the Unitex Applied Finishes range. With certain site conditions such as shaded areas, lower temperatures or high humidity, curing of the render may take longer, even up to 7-10 days. Always check the weather forecast before applying renders to masonry surfaces as rain, especially within the first 8 hours after application, has a tendency to damage and weaken the render or at best, leave water marks. Heavy rain at any time during the initial 2-3 weeks may leave water marks on the surface. 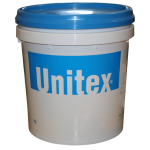 Should rain damage occur, the render integrity and adhesion must be checked, and any necessary repairs carried out and then allowed to fully dry prior to allowing Uni-Dry Cote® Fast–R Render to be overcoated.